Jack Whytock in Christian Observer: . . . this book is most helpful particularly I believe for Presbyterians to take time and read. 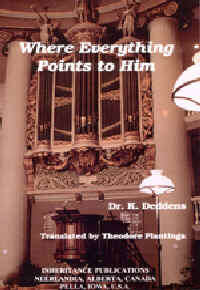 . . the remainder of Where Everything Points to Him is basically an analysis and commentary on the constituting elements in worship in these Reformed Churches. It certainly makes for some interesting and edifying reading. . . I encourage a wide audience of our readers to study this book. The author deals with the history of the Book of Praise, Anglo-Genevan Psalter and with the history of Reformed Psalters and liturgies from the early church till today. 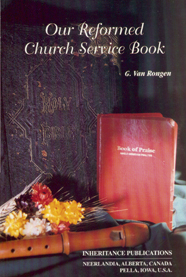 A book for all who serve, not only ministers and elders but also as regular members of the church. The aim of this book is to set forth the Scriptural principles of Reformed church polity. Considering the paucity of material on Reformed church government, it fills a critical gap in ecclesiastical literature today. It is also designed to assist in answering many questions concerning the proper order of church government and the role of major assemblies in Reformed church government. The articles will assist churches grappling with the issues of independence and hierarchical government to implement patterns of order that model Biblical teaching. This book is an attempt to draw out from the Bible how the Lord would have His Church be governed. Through a process of detailed Scripture study, the author concludes that the historic Church Order of Dort encapsulates God's revealed wish for how matters ought to be done in His Churches. As the ecclesiastical scene moves and changes, churches do well to look at the Scriptures behind Dort and apply the principles of Reformed Church Polity with renewed enthusiasm. A practical guide to the use of the Church Order of the Canadian Reformed Churches. The conditions for living together in one federation as formulated by the Synod of Dordrecht 1618-1619 stood for almost two centuries. It is, therefore, customary to speak of the Church Order of Dordrecht. May it suffice to state that our present Church Order is still essentially the same as the one adopted in Dordrecht, even though changes had to be made in the course of the years. What, then, is the specific essence, character, and form of Reformed liturgy? It is COVENANTAL. Rev. Van Dooren ends the introduction of this book with the following paragraph: We conclude with another quotation from C. Trimp, p. 12: Liturgical questions demanded the attention of the re-formed Churches even before Creeds and a Catechism. It was in her re-formed liturgy that the re-formed Churches presented themselves to the world, also the world of the false church.